From how your horse enters the trailer, to how you tow the trailer behind your vehicle, configuration, and design, there are many options to consider when looking for a horse trailer. One of the first things to consider is the size and style of horse trailer. When towing fewer than three horses, a simple bumper towed trailer may be sufficient for most equine enthusiasts. A bumper towed, or tag-along, trailer connects to the tow vehicle with a coupler on the front of the trailer that attaches to a hitch on the bumper of the vehicle. Bumper pulled horse trailers are generally smaller than the larger gooseneck horse trailers, which are designed to carry more than three horses, along with tack and other gear. Most bumper towed trailers can be pulled without a special vehicle and are generally the least expensive horses trailer to purchase. When transporting more than three horses, traveling with lots of tack, and making extended trips, a gooseneck horse trailer may be the best choice. A gooseneck trailer includes a main trailer body and an overhang that slides over the bed of the towing vehicle where the coupler connects to the truck. Goosenecks, like fifth wheel travel trailers, are more stable than bumper towed trailers, safer to drive, and easier to maneuver. Gooseneck trailers will have room for horses in the back and most will include an area for tack in the front, and in some cases, saddle racks. The largest horse trailers may also be called fifth wheels, named for the type of connector to the towing vehicle. Because of trailer and load weight, fifth wheel horse­ trailers, which look no different than goosenecks, require the stronger fifth wheel-style connector to the tow vehicle. When traveling long distances or staying for shows or business, consider a living quarters horse trailer. 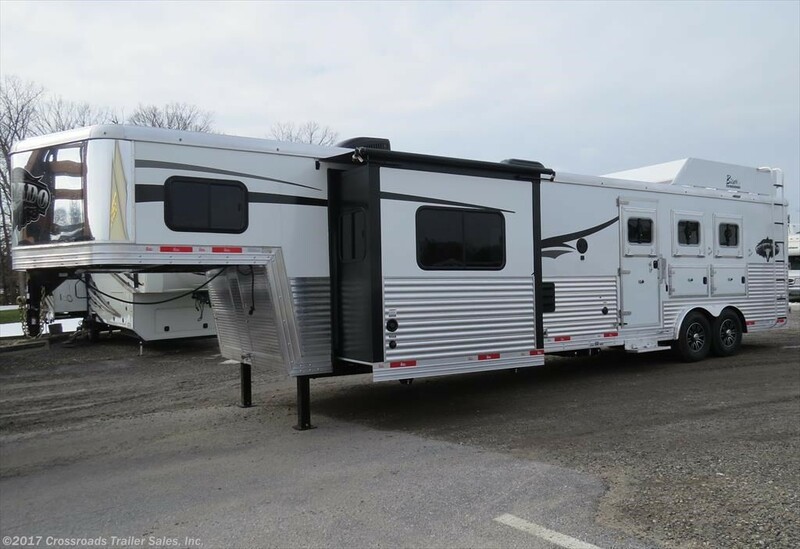 A cross between a horse trailer and a fifth wheel travel trailer, living quarters include room for horses and gear in the rear, with travel trailer-like amenities in the front, such as beds, kitchen, storage, and bathroom. 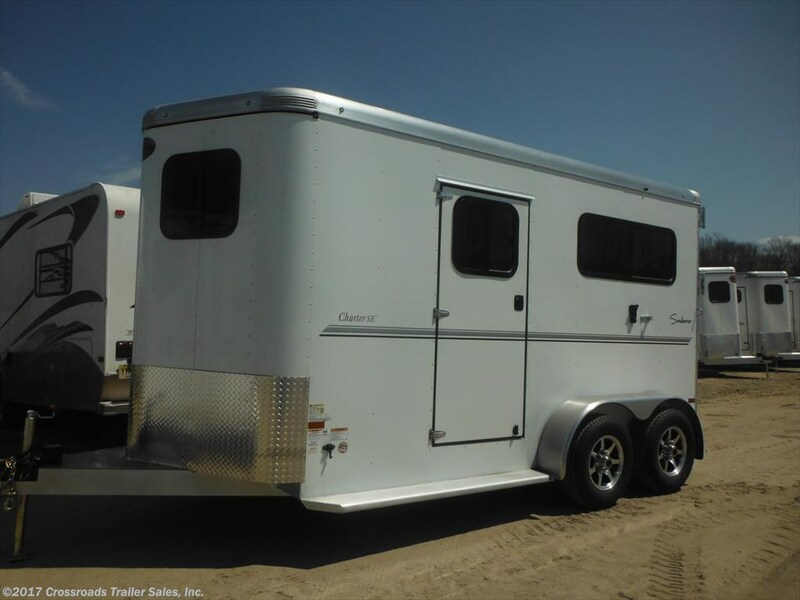 Living quarter horse trailers can be the most expensive horse trailer to purchase, but may pay dividends over the long haul for those who travel and stay frequently with their horses. Living quarter horse trailers can be simply designed, with a small kitchen, dinette, bathroom and bedroom at an affordable price point. For those who crave more, a living quarter horse trailer can be as luxurious and home-like as a high-end motorhome, with fully-outfitted kitchens, fireplaces and entertainment centers, and roomy master bedrooms. 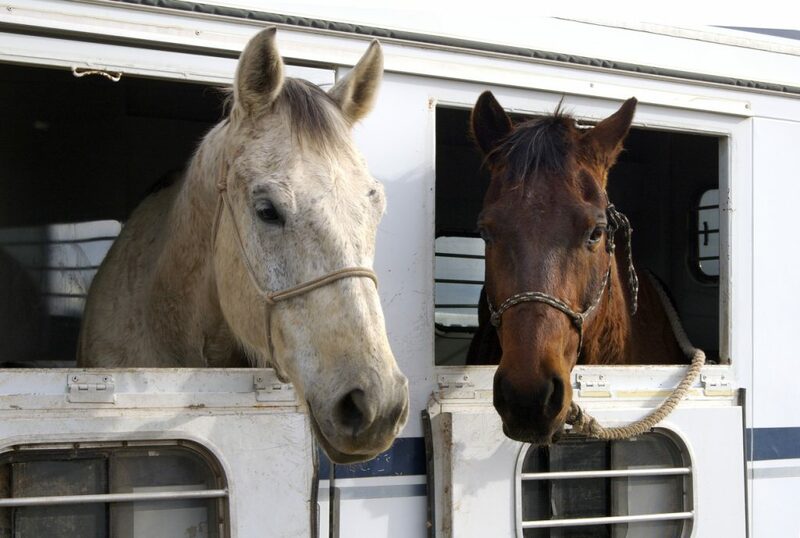 How horses travel in the trailer is the next decision. Horse trailers can be configured as straight load, which mean the horses are walked straight into the trailer from the back gate and stand side-by-side facing forward in transit. Straight load is a common configuration in smaller, one-or-two horse, bumper towed horse trailers. Straight load trailers have a safety feature favored by many: a door at the front that allows the handler to simply and safely exit after walking the horse into the trailer. When transporting more than two horses, consider a slant load horse trailer. Most slant load trailers will be larger than straight load trailers and include room for tack tucked into the empty areas created by the slant configuration. Horses travel side by side in diagonal stalls. While most slant load trailers feature rear gate entry, the largest models may also have a side gate. The choice between purchasing a new horse trailer or a used model is a balancing act of budget and needs. A basic well-used horse trailer may be found for little more than $1,000, but safety and repair issues may make it a poor bargain. Look for used horse trailers with well-maintained exteriors, a solid record of mechanical and electrical maintenance, clean, safe interiors, and a floor that has been well maintained or recently replaced. While a new trailer may be a larger investment, a factory warranty may sweeten the pot, and assurance that lights, brakes, floors and hinges are all in pristine condition may seal the deal. 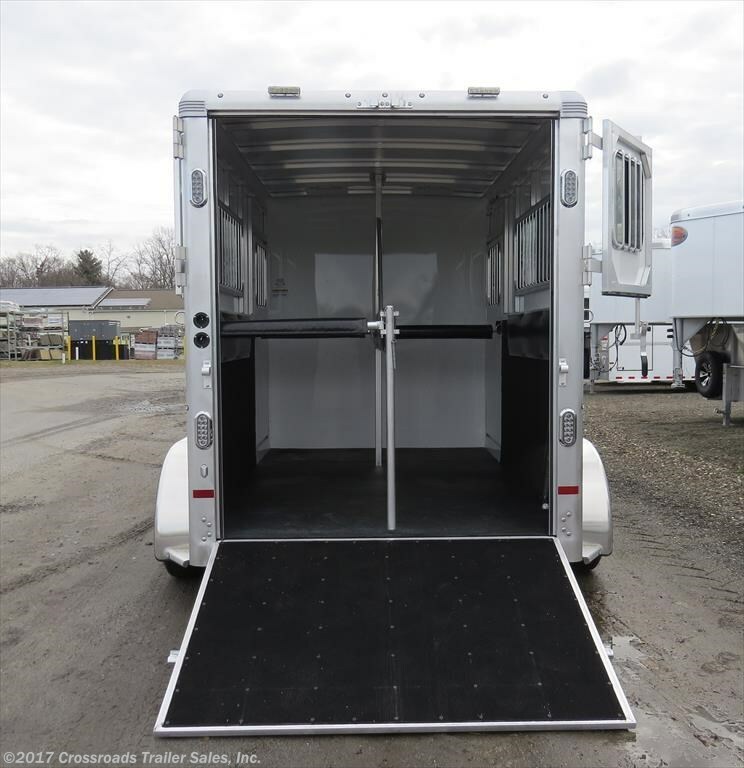 A factory-fresh horse trailer can also be configured to fit the buyer’s exact needs. 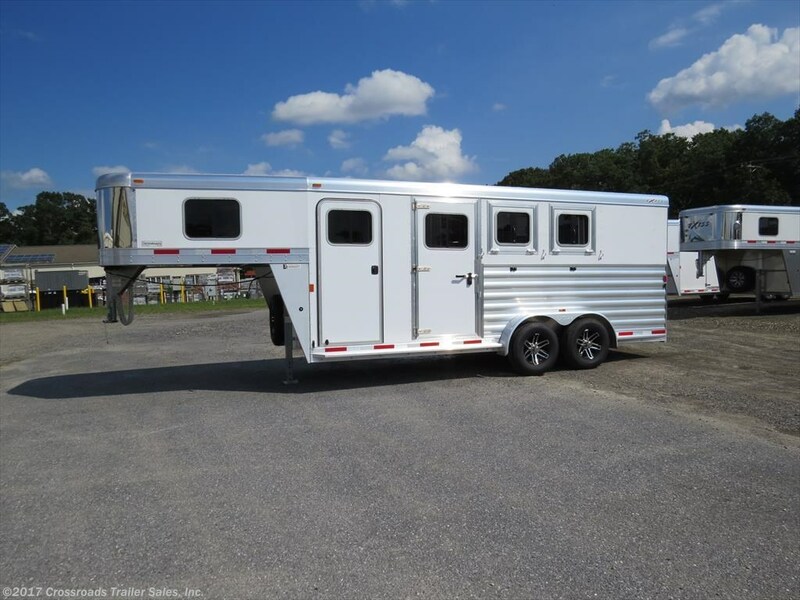 Whether it’s gooseneck or bumper, straight or slant, new or used, the horse trailer experts at Crossroads Trailers in New Jersey can guide you to the right horse trailer for your needs. Call (856) 697-4497 or visit our dealership if you have any questions! This entry was posted in horses, RV Advice and tagged 2h, 3h, 4h, bumper, gooseneck, horse trailer, horses, living quarter, lq, slant load, straight load by admin. Bookmark the permalink.